Page Write Time 5 ms Max. Read current 500 uA, max. Standby current 5 uA, max. 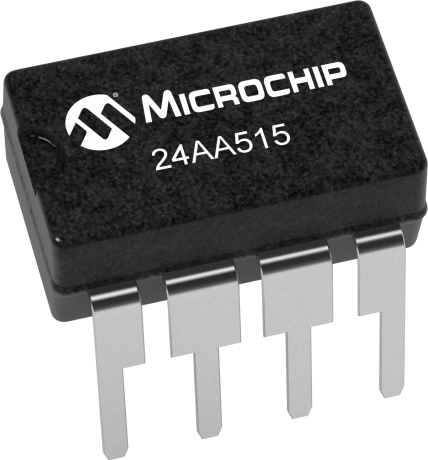 The Microchip Technology Inc. 24AA515 is a 64K x 8 (512K bit) Serial Electrically Erasable PROM, capable of operation across a broad voltage range (1.7V to 5.5V). It has been developed for advanced, low-power applications such as personal communications or data acquisition. This device has both byte write and page write capability of up to 64 bytes of data. This device is capable of both random and sequential reads. Reads may be sequential within address boundaries 0000h to 7FFFh and 8000h to FFFFh. Functional address lines allow up to four devices on the same data bus. This allows for up to 2 Mbits total system EEPROM memory. This device is available in the standard 8-pin plastic DIP and SOIJ packages. The Serial EEPROM PIM PICtail™ Modules are a series of boards designed around Microchip Serial EEPROM devices. The boards are designed to interface with the PICtail Plus connector as well as the MPLAB® Starter Kit for Serial Memory Products and the PICkit™ 2, allowing you to get started right out of the box.